Create Your Own Custom Eye or Blush Palette Online. Don't like the price but this is cool! 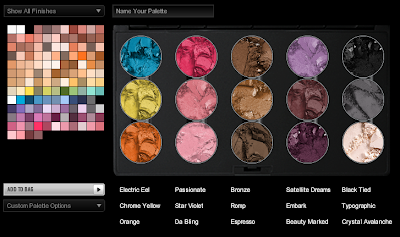 Create Your Own Custom Eye or Blush Palette Online at M.A.C Cosmetics. Choose the shades and finishes from a selection of over 130 eyes shadows $47.50 - $177. Here is my customized palette ... it will remain in my shopping bag!